The date of its foundation has not been established precisely but it was around the year 1078 that the founder, St Stephen of Thiers, established himself and his followers in the forest of Muret some five leagues from the city of Limages in the Limousin. The Order certainly pre-dates that of the Cistercians (1098) and the Premonstratensian Canons (1120). During the lifetime of St Stephen the brethren followed a totally eremitical existence inhabiting separate cells grouped around a small stone oratory which was modelled on the simple rural churches prevalent in the region at the time. As the number of followers multiplied, new foundations or 'cellae' were established in the same area. The brethren adapted the cheapest and roughest cloth available for clothing and were totally vegetarian in their diet. Following the death of St Stephen in 1124, a dispute with the local Benedictine monks over land rights forced the brethren to leave Muret. Bearing the body of their founder they moved to a new site at Grandmont which become the mother house of the Order until its suppression by Pope Clement XIV, less than twenty years before the French Revolution closed all the monasteries of France. In its early years the Order spread very rapidly, by the mid 13th century, point of maximum expansion, close on 150 cellae had been founded. Only five of these foundations were outside France, in addition to the three English houses there were two in Spain. By the mid 13th century the Order was affected by the monastic malaise prevalent throughout Europe at the time. The numbers of religious declined, the life style of the remainder became increasingly decadent and religious observance began to be partially if not wholly neglected. The Order might well have sunk into total oblivion if Pope John XXII had not taken a hand. In 1317 he reformed and reconstituted it along more conventional monastic lines. Grandmont was raised to the status of an abbey with William Pellicier, the 23rd prior, appointed abbot. The remainder of the houses which had previously been known as 'cells', henceforth became 'priories' whilst their rulers, previously called'correctors'became'priors'. A system of annual visitation was instituted and priors were required to report regularly at the annual general chapter held at Grandmont. The Order recovered but its eremitical character disappeared forever and the Grandmontines began to have more in common with regular canons than the group of hermits who had left Muret for Grandmont. The trials experienced by the Mother House continued throughout its history. It was under siege during the Hundred Years' War and the brethren at one point were forced to flee before the army of the Black Prince. It suffered subsequently at the hands of marauding bandits, was pillaged by the Huguenots and reduced to dire financial straits by a succession of commendatory abbots. The 17th century witnessed the spread of a monastic reform movement in France. The Grandmontines found their equivalent of the Cistercian reformer Abbot de Rancé in Dom Charles Frémon, and in common with the Cistercians the Order was split into two groups representing the 'strict' and 'traditional' observance. This unfortunate division hastened the final disbanding of the Order. By 1767 the number of professed religious at Grandmont was down to nine and in 1772, Pope Clement XIV on the advice of the French Religious Commission ordered its total suppression. The great abbey of Grandmont was dismantled, the bulk of it being carted away to build a prison at Limoges. However, the picus local people managed to save sufficient stones to bnild the tiny chapel of St John the Baptist which alone identifies the site today. Prior to the reorgan is ati on of the O rder un der Pope John XXII and the subsequent relaxation of the strict observance, the Grandmontines led a life which took austerity to the limits of human endurance. Their Rule was defined under the fourth prior of Grandmont and based on the maxims of St Stephen, orally transmitted. St Stephen anticipated the teaching of St Francis of Assisi in his insistence that there is no rule but the Gospel. Poverty and implicit obedience are the key words of this document. which represents more of a spiritual treatise than a practical constitution for a life lived in community. Some of the more practical considerations are as follows: the 'cells' were to be sited in solitary places but never too far from a main thoroughfare, for the brethren were dependent upon alms for their livelihood, being barred from owning land outside the actual boundaries of the monastery. In addition, they had always to seek the natural enclosure afforded by woodland areas. Although they were permitted to receive rents from lands by way of alms, should the heir of a donor discontinue such payments the brethren were forbidden to invoke the law in order to claim their rights. They were not allowed to main tain he rds in the manner of the Cistercians as the need for pasture m ight cause people to say: 'Would that these hermits had never come here, for they increase their possessions and are a nuisance to us'. They were forbidden to minister as priests except to the dying in cases of extreme necessity when an alternative priest could not be found. The pattern of the daily life lived by a Grandmontine hermit is shown to us through 'The Mirror of Grandmont', the work of the seventh prior, Gérard Ithier. From this document we learn that each 'cell' had a senior lay brother, the 'curiorus', who was responsible for all temporal administration. He it was who distributed food, clothing and other necessities as required and he was also entrusted with the care of the sick. Unlike the Cistercian lay brothers who were provided with separate quarters, the Grandmontines recognised no distinction between the separate classes of 'clerk' and 'conversus'. 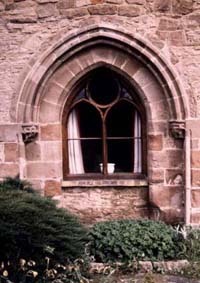 Both groups shared the same choir, cloister and chapter house, ate in the one frater and slept in the communal dorter. Neither was there any distinction to be made in dress or appearance -- the Cistercian lay brothers were bearded and were assigned different attire from the clean shaven choir monks. All Grandmontine brothers wore sackcloth next to the skin covered by a brown tunic and round hooded scapular; they were also prescribed woollen gaiters and leather shoes. In church they all wore surplices; a tradition which later led to them being mistakenly classed as canons rather than monks. In the matter of diet, the 'Mirror' tells us that meat and lard were strictly prohibited even to the sick. From September 15th to Easter they fasted except on Sundays and Christmas Day. From Septuagesima until Easter they also abstained from eggs and cheese but between Easter and September they were permitted two meals a day. The hours set aside for prayer were long. In company with other religious orders, they recited the hours of the Divine Office, retiring to bed at sunset after the Office of Compline and rising in the night to celebrate Nocturns. Unlike other orders, however, the ritual in their churches was uncomplicated; their small single-aisled churches did not allow for any elaborate processions and ceremonial. They maintained one distinctive liturgical feature: three times daily they processed solemnly through a specially constructed passage to the cemetery behind the church, where they recited the Office of the Dead. The superior or 'corrector' of each 'cell' was elected by the common consent of the brethren, as was a senior lay brother, the 'curiosus'. A distinctive feature of the Order lay in the fact that the 'curiosus' held a position of seniority at least equal if not actually superior to that of the 'corrector'. The Rule likens the functions and status of choir and lay brethren to Mary and Martha in the Gospel. We nowhere read that Mary held sway over Martha or vice versa. Ultimately the lay brethren did succeed in gaining the upper hand with unfortunate consequences for the Order. There was a serious crisis in 1186 when the lay brethren beat up the choir monks and expelled the prior from the Mother House. An interesting account of the resentment which led to this incident is given by Guiot de Provins, a soldier who participated in the third Crusade. When he returned to France early in the 13th century he resolved to become a monk and circulated the monasteries of the various orders in the course of deciding which to join. His satirical account of his travels praises the church services of the Grandmontines together with their cuisine which included garlic soup and spicy sauces. He deplores, however, the relationship between choir and lay brothers. The choir monks, he relates, dared not commence a church service until the lay brothers gave their consent, and if they did, could expect severe beatings by way of punishment. The situation was resolved only when Pope Honorious III decreed that the ruler of each 'cell' be a choir monk and that the 'curiosus' be responsible to him in all things. The sleeping arrangements in a Grandmontine 'cell' required a common dorter which was divided into separate cubicles by wainscotting. This semiprivacy was subject to some criticism as representing luxury, but in fact it was all that remained of the primitive 'laurae' in which the founding hermit monks lived at Muret. Craswall is one of three foundations established in England by the French Order of Grandmont in the first half of the 13th century; the others are in Yorkshire and Shropshire respectively. Grosmont, near Whitby in Yorkshire has disappeared almost without trace. It was the first house to be established and the last to be dissolved by Henry VIII in 1536. Alberbury in Shropshire was confiscated as an 'alien' priory by Henry VI in 1441 and gifted to All Souls College, Oxford whose property it remains and who lease it as a farm. Only the presbytery of the church together with the north chapel remain. Utilised centuries ago for living accommodation, these areas have been subjected to numerous alterations and their present day aspect is typical of a late Victorian farm house. In common with Alberbury, Craswall was confiscated by the Crown in 1441 and gifted in turn to God's House later united with Christ's College, Cambridge. Although it is in an appalling state of ruin, the fact that it has been allowed to simply moulder has saved it from the alternative and worse fate suffered by Alberbury and it has retained its unique Grandmontine ground plan. In this respect it rivals in importance the numerous French sites of the order which, like Alberbury, have been altered and mutilated for various purposes but principally to adapf them for use as farm buildings. Craswall is exceptional in that whilst it has suffered from centuries of weathering it has been spared the even more damaging onslaughts of man. 1984 saw the foundation of this society which has, as one of its main aims the preservation of the ruins of this unique priory . The City of Hereford Archaeology Committee was strongly in favour of this project and the two organisations approached the Historic Buildings and Monuments Commission and obtained a small grant towards essential clearance work which went ahead in 1985. The extensive remains of the priory at Craswall can now be fully appreciated and the extent of the deterioration of the fabric since the 1904 - 6 clearance can be assessed. Much stone has fallen during this eighty year period. The internal faces and the framework of the north and south chapel doorways have disintegrated, leaving only the corework. Walls which still survive in places to the departure of the vaulting, are leaning precariously. Craswall Priory, the only Grandmontine house in England with substantial remains, is a unique site where the complete unconserved remains of a small medieval priory are now exposed to view for the first time in three quarters of a century. The Historic Buildings and Monuments Commission are being pressed to extend the scheduled area, fo undertake selective clearance of the rubble, record the masonry as it is exposed and to consolidate the remains so that they can be appreciated by future generations. While it is Hereford based, the Craswall Grandmontine Society has a membership distributed throughout the United Kingdom and France. It is affiliated with the Association of the Abbey of Grandmont near Limoges. Members everywhere are united in their determination to save this important historic monument from extinction but time is running out. The Craswall Grandmontine Society is a registered charity No. 515118. Map : Ordnance Survey - Landranger 161 - Abergavenny and the Black Mountains - 1/50.000 - long. 3 04' - lat. 52 02' . The second phase of the restoration, costing 182 938.82 euros should start soon. We are still trying to raise enough money for this next project which includes the vaulting of the choir, the roof and the restoration of the monks' entry. Any money raised will go towards the conservation of the church. Rauzet has been the subject of several presentations at various venues: Le Centre de Recherches Historiques et Archéologiques Médiévales de l'Université de Limoges, at the Sociétés Historiques du Limousin, de la Charente, de la Creuse, de la Charente Maritime and at a Combined research programme ( PCR) de l'Université de Poitiers. We had a special visit from the members de l'Association du prieuré grandmontain des Bronzeaux, ARABEL. Rauæt was again the centre of attention at a special party in Combiers last autumn. This year there will be an Epicurian Visit on the 30th of August 2002 and the Open Days on September 21 and 22. The annual General Meeting will be on September 21st at 2.30 P.M.
Carole Hutchison and Kate Douglas. Book :The hermit monk of Grandmont - Carole a. Hutchison - Cistercian Publications n 118 St Joseph's Abbey - Spencer, Massachusetts 01562 - (508) 885 - 7011.